For the first time since my recent conversion to evidence-based thinking regarding GMOs (not even two months ago), fresh bait has emerged – the newest darling of the “Biotech Birthers” (my own alliterative term to describe the activists who will stop at nothing to find fault with GMOs). Oh boy! I’m on the science ship now! My post today shines a spotlight on a just released animal feed study with an impressive title: A Long Term Toxicology Study on Pigs Fed A Combined GM Soy and GM Maize Diet by (I’ll just name the first two names of the long list of authors) Judy A. Carman and Howard R. Vlieger. Here is a summary of the findings: 168 pigs were fed either conventional, non-GM soy and corn feed or GM soy and corn feed for five months. This length of time is the average a pig will spend on a farm before it is slaughtered. In addition to studying the pigs during the five months, autopsies were performed at the time of slaughter. The conclusion by the authors is that the pigs that ate GM feed were more likely to have severe stomach inflammation. Also discovered were bigger uteri among the females. When Genetically Modified Pigs Fly! 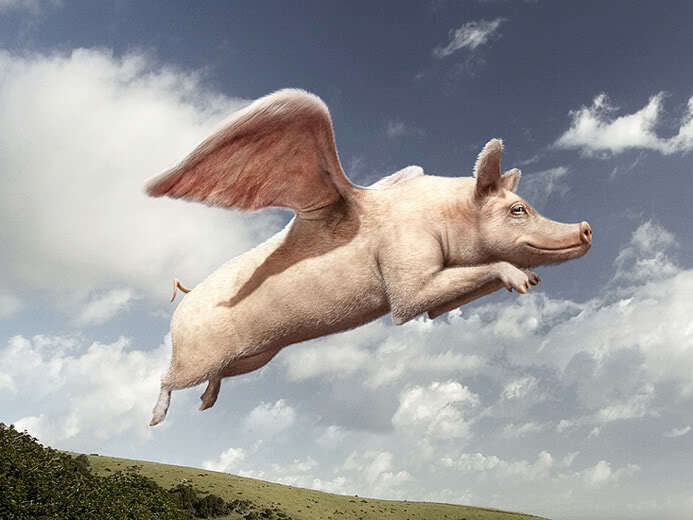 If this study is proper, peer-reviewed science, as it claims to be, then flying pigs might also be within the realm of possibilities, as the image above shows. Really, it’s another crappy study dressed up in a suit, like the Seralini rat study and the more recent glyphosate gut microbiome fiasco. After lift off, a sensationalized study like this quickly gains enough altitude to jettison it’s rocket boosters, at which point it blasts into the blogosphere and settles into orbit. Once there, it will appear again and again and again. Before the fervor dies down, which could take months, it will have been read by millions of people. Health Ranger Mike Adams, Ronnie Cummins of the Organic Consumers Association, GM Watch, Earth Open Source and let’s not forget the master at scary article writing, Joseph Mercola, either already have or will very soon wrap this glistening new study in brightly colored paper, tie it up with shiny ribbons and a bow and from there, social media mavens at Moms Across America will likely circulate it well beyond Earth’s orbit to, oh, Saturn maybe. Particles from the study could escape our solar system and in the vacuum of space, be sucked in every direction. On the long return trip to earth, the Moms will, unbeknownst, be attracting facebook likes from hitherto unknown lifeforms on Class M planets within and without our galaxy. After all of that, every speck of dust in the cosmos and even my little comet goldfish will know about those poor pigs! If all that sounds ridiculous, it is because it is. Were it just a sci-fi spoof, we could all have a good chuckle and take another sip of beer, but unfortunately, a similar scenario is taking place, minus the space part. Most of my readers are well aware that at one time, I would have believed this study and posted it, no questions asked . Shocked and horrified, commenters would have thanked me for helping raise awareness of these horrible microscopic brutes infiltrating our food and animal feed. So, what is wrong with this new study? To answer that question, I decided to get two expert opinions. I contacted two highly qualified individuals whom I respect and follow on twitter. I will include both responses as they wrote them with few edits, except for some bold text for emphasis. The first expert is Val Giddings, Senior Fellow for Life Sciences with ITIF, a non-partisan, non-governmental think tank based in Washington, DC. He has worked in the area of agricultural biotech risk assessment for nearly three decades. Val Giddings: What’s wrong with the Carman-Vlieger pig feeding study? Hard to know where to begin. The first thing that strikes me is the utter implausibility of what they claim – that pigs fed a diet of biotech improved corn are harmed in ways that have miraculously escaped the notice of the thousands upon thousands of farmers who raise swine and cattle around the world. Farmers have thin profit margins and they watch their animals like hawks. If something aint right, they notice it, and try to fix it immediately. Those who don’t do so go out of business in a hurry. So, on its face, the paper starts out as suspect. Moving to their specific claims, they assert that pigs fed a diet of biotech improved corn show an excess of “inflammation” (compared to controls) in their stomachs which is nevertheless not reflected in any detectable differences in weight or overall health. If the reported observations represent pathology, they should be correlated with measurable negative health outcomes in additional areas. They are not. What on earth is going on? Time for a quick gut check — step back and ask – how many parameters did they evaluate? If more than 20, you would expect on statistical grounds alone to have at least one apparent hit caused just by statistical artifact. They tested more than 20 parameters, and claim – wait for it — one hit – exactly what statistics would predict. So is it real, or an artifact? As noted above, given the absence of correlated pathologies, it looks like an artifact. When you see in their data, however, that there are actually higher levels of inflammation overall in the “control” animals fed non GM diets, which was not commented on by the researchers, the rat really begins to stink. Then take a look at their feeding regime – Just like Irina Ermakova , they didn’t take careful records on exactly what each group was fed, nor how much they ate; indeed they claimed that even their control diets had varying levels of “GM” material. In other words, they don’t know how much of what was eaten by ANY of their animals. This makes any calculation of a dose/response relationship impossible (toxicology 101 FAIL), and any attribution of any observations to any dietary differences completely unsupportable. At this point, anybody who’s ever judged a High School Science Fair has got to be thinking “F.” Complete and utter rubbish. Further points to consider – they claim “no competing financial interests” even though Jeffrey Smith and organic entities are among the funders – all of whom make a bundle off ag biotech fearmongering; and one of the co-authors runs a farm for which non GM products are the major selling point. Not only do these folks obviously not know how to design and conduct a feeding trial, it seems they don’t know how to tell the truth. And they must think we’re all stupid not to notice any of this. There is additional icing on the cake – the incidence of pneumonia reported in test and control animals is far higher than consistent with minimally acceptable animal husbandry (more animal abuse in the pursuit of agenda peddling, a la Seralini). Expert number two is William Price, currently a statistician in the College of Agriculture at the University of Idaho who has worked in agricultural research for 35 years. Bill Price: The study contains several statistical problems. First and foremost, the design is not clear. Animal studies like this typically employ standard experimental designs (the layout of treatments, etc) that account for differences in animal weights, fitness, etc, as well as how the animals are kept (stalls or pens) and randomly assigned to the treatments. The idea behind these designs is to isolate and account for unwanted variability that may confound the treatment differences you are interested in measuring. An example of good design would be an analogous study on pigs that set up groups of animals based on weights and pens: http://www.ncbi.nlm.nih.gov/pmc/articles/PMC3344822/. The current pig study does not elaborate on how or if these things were considered. A second set of points would relate to the analyses carried out on the data. One objection is the number of tests done. When you do several tests like they have, you leave yourself open to finding false positives just by chance. This is a well known problem and is usually countered by either limiting the number of tests you look at, or by being very conservative in what you accept as a significant result. In other words, if it is not highly significant, don’t count it. There are formal statistical methods for doing this, but they apparently did not use them. Yet another, and worse, objection has to do with the actual analyses they used. They seem to use a mish mash of test types, each which has different statistical assumptions behind them. In a technical sense, much of the data is either comprised of discrete counts or data of unclear statistical properties. In common tongue, the data may not meet those assumptions for the analyses. There are various methods for dealing with these situations, such as the one shown for this data by Andrew Kniss on his blog or those used in the paper referenced above. The main complaint he addresses is that the stomach severity data (the percentages of none, low, moderate, and severe) are not treated properly. Such data are what we call multinomial, that is, the responses are all related to one-another (the percentage of the categories all add to 100%, for example), and as such, the categories can not be handled separately. They must be considered simultaneously. Again, there are a multitude of statistical procedures to do so (I tried several on the severity data and came up with non significant results in all cases), but they decided to separate each category and to do their tests on them one at a time. This simply is not correct and will lead to incorrect conclusions. Finally, the data quality itself is highly suspect. Far more than 50% of both the GM and Non-GM groups showed signs of pneumonia. Animal mortality was 13-15%, which from my understanding of swine production, is 3-5 times higher than the normal (note that the authors claim it is normal!). Clearly, these animals were quite sick and any treatment data collected from them would be confounded and unusable. Quite frankly, any animal researcher should be embarrassed to present such data as it show their ineptness in animal care. My thanks to Val Giddings and William Price for their answers that I found to be, not coincidentally, very similar. No, they did not know the other was answering the same question! 1. The photo, along with its headline, looks to me like something from the National Enquirer that a third-grader would bring for current events. 3. Ermakova is the Russian anti GM campaigner posing as a scientist who published, via a Greenpeace issued press release, the claim that GM soy caused all sorts of problems in rats. Turns out she did not characterize nor did she quantify what she fed her animals, so she never knew what they ate nor how much, making any dose/response calculation impossible. Plus, as in this current animal feeding study, her measurements and miserable success raising the rats showed she didn’t now how to run a rat colony or care for rats, just as Carman & Vlieger show they don’t know how to care for pigs by the ridiculously high levels of pneumonia. Very nice. They also say in the paper that they did not use gm food and its isogenic equivalent– they got different diets. They also make an ambiguous comment about obtaining stomachs from another source, not clear what that means. The stats people are spot on. Plus, a big difference between statistical significance and biological significance. PLUS!! MOST OF ALL the second author, Howard Vleiger is the guy that is the source of the fabricated and irreproducible Stunning Corn Comparison!! He’s got the cred! Nice stuff Julie. I knew Vlieger was THAT guy and wanted to do a footnote about it but didn’t because I had already done the other footnotes and it would have been first Lazy I guess! The sad thing about this “study” is that all the anti-GM people latch on to it and will post it all over the place thinking that this is their saving grace of what they have been preaching. It drives me nuts when uneducated people tout their stuff like the have “scientific proof,” when in reality all they understand is the bits and pieces from bogus websites like Mercola, Smith, and Natural News. Keep up the good work Julee on looking beyond the propaganda! They already have, JMR. Fortunately folks like our Julee, Mark Lynas and the good Phd’s at biofortified.org have posted their analyses of this, “study”. First, let me admit that I haven’t even read the Carman paper, so my comment may be invalid. I’m commenting based only descriptions in the public criticism. 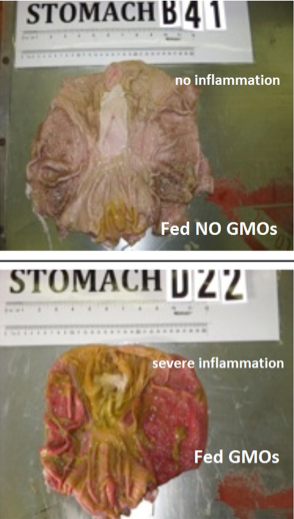 One of the things the authors did with the stomach inflammation data was to separate the test and control animals into subgroups based on severity of the stomach inflammation and then report that there were more of the GMO fed pigs in the worst subgroup. If the criteria for separation into severity categories is specified beforehand, OK. But if one has the freedom to look a the data first and then create the categories it’s another fruitful way to cherry pick the data. For example, here are two totally random data sets that I created by just using a random number generator. Let’s imagine that big numbers represent worse health than small numbers. Just by chance set Y has an average of about 53 and set X has an average of about 43. So Y represents worse health than X, but just by chance. Now suppose I say that a big number is anything 50 or more. Y has seven severe cases and X has only six. There were multiple problems with this study. The statistics alone were completely ripped apart for some of the very reasons you’re describing – in essence – data mining.